If you like your art noisy, unconventional, mixed up with lots of other stuff, and against a whacky backdrop, and your music electronic and unpredictable, then this is one for you. Noise of Art is an umbrella label for a group of talented musicians under the loose leadership of founder Ben Osbourne. This performance (to celebrate the release of a new album, Picadilly Nite Version #1, this spring) sees them teamed up with the BFI on the Southbank, and promises to be really exciting. Having blasted you into the mood, the performers will all put their best DJ hats on and host an hour or two of rather special club night – so make sure that you wear the right shoes. This gets a very big Londonist thumbs up – but then this Londonist is a rampant techno-babe at the best of times. You could do a lot worse for a rainy Thursday evening in January. 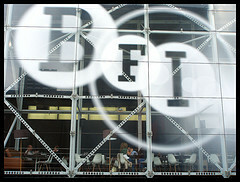 BFI Southbank (formerly National Film theatre), is at 1 Charlie Chaplin Walk, London SE1 8XR. Tel: 020 7928 3232 to book, or you can book online. Entry £8.60…unless you’re a member, in which case you get a £1 discount. Piccie courtesy of everydaylifemodern’s flickr photo stream.